Peavey Plaza’s fountains have fallen into disrepair. Minneapolis’ Peavey Plaza, a classic but poorly maintained “park plaza” (to borrow the term its designer, landscape architect M. Paul Friedberg, coined to describe it), has escaped demolition, preservationists announced Friday. The Cultural Landscape Foundation said they’d reached a settlement to preserve the 1975 public space, ending a lawsuit brought by TCLF and the Preservation Alliance of Minnesota in June 2012. It awaits the signature of Mayor R.T. Rybak. Last year, against objections from a coalition of preservationists led by TCLF, Peavey Plaza was slated to be razed. A rift had developed one year prior, after city-led redevelopment plans threatened key elements of the original design, prompting Friedberg and TCLF president Charles Birnbaum to split from the team tasked with bringing the aging modernist plaza up to contemporary standards. 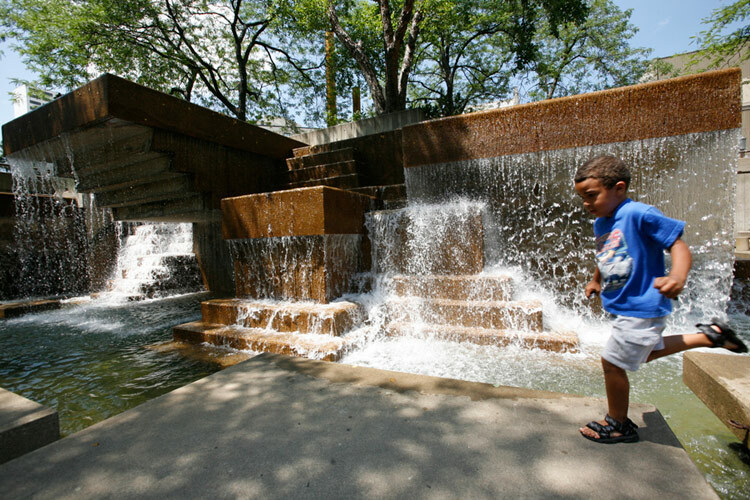 Peavey Plaza landed on the National Register of Historic Places in January — one of a small fraction of sites on that list with significance in landscape architecture.